The penultimate round of the Rugby Africa Gold Cup sees Namibia claim the title with a convincing win over rivals Kenya, while Tunisia shock Zimbabwe to climb six places in the World Rugby Rankings and stay in the hunt for a place at RWC 2019. 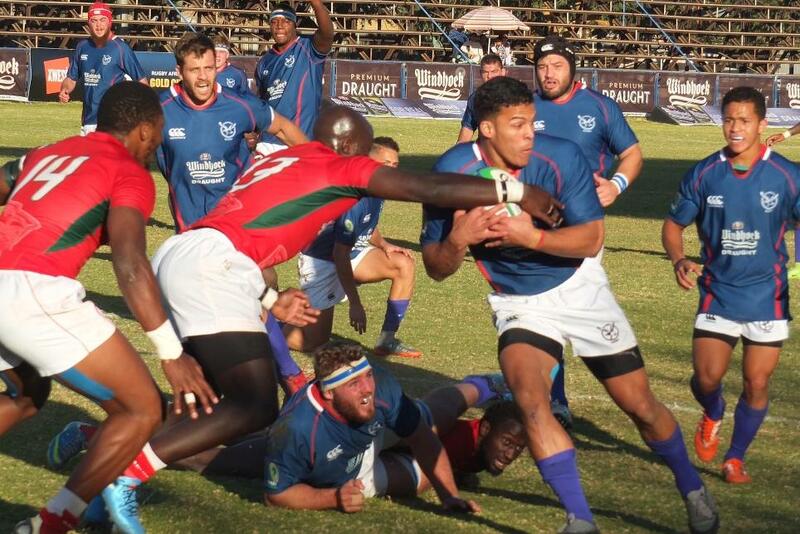 Namibia captured their third straight Rugby Africa Gold Cup title in emphatic style with a 45-7 win over rivals Kenya in Saturday’s all-important encounter in Windhoek. It was the Welwitschias' fifth consecutive bonus-point win of the campaign and easily their best performance considering the opposition. Phil Davies’s side went into the title decider holding a four-point lead over the Simbas at the top of the Gold Cup table knowing that either a draw or a win would be enough for them to be crowned champions. After a lively start from the visitors, it was Namibia who took the lead through David Philander with Clive Loubser converting. That 7-0 lead was doubled on the half-hour mark when the hosts capitalised on a Kenyan error to work a score for Chrysander Botha. Namibia then overcame the loss of a man to the sin-bin to close out the half without conceding any points. Loubser crossed for Namibia’s third try shortly after the restart as they stretched further in front before JC Greyling secured the bonus point with their fourth try of the match. Moses Amusala finally got Kenya on the board with a try that David Mukidza converted, but that was as good as it got for the Simbas as Namibia rounded off another successful campaign in style by scoring 19 unanswered points. Philander crossed for his second before Casper Viviers and Les Klim got in on the act with Loubser slotting two conversions for the 45-7 full-time score. Namibia’s victory was worth 0.67 of a rating point, taking them on to 61.40 points. They stay in 21st place with Kenya still four places back in 25th. Meanwhile, Tunisia shocked Zimbabwe 31-23 in Harare to keep alive their hopes of competing in next year's Gold Cup, the winner of which will qualify for RWC 2019 as Africa 1 and join defending champions New Zealand, South Africa, Italy and the repechage winner in Pool B. Without a point to their name before Saturday’s match began, Tunisia stunned the Sables with a three-try victory that not only lifts them off the bottom of the Gold Cup table but also sees them rise six places in the rankings to 45th on the back of a 1.69-point gain. Zimbabwe slip four places to their lowest ever position of 40th with Uganda, who they meet in their final Gold Cup fixture in Kampala next Saturday, Ukraine, Lithuania and Paraguay all profiting from their demise. Zimbabwe now need a bonus-point win of 30 points or more to stand any chance of overhauling Uganda and claiming third place in the Gold Cup, while the fight to avoid finishing bottom will take place in Monastir as Tunisia host Senegal. Senegal are now favourites for the drop into the second-tier Silver Cup and elimination from the RWC 2019 qualification process as they trail Tunisia at the foot of the table by three points, knowing that only victory will do. In the only other match to take place at the weekend, USA South beat Guyana 23-19 to win the Rugby Americas North Championship 2017. USA South held a 16-point lead going into the final three minutes but a double from Green Machine replacement Osie McKenzie made for a grandstand finish.